Relationship based lending is built upon the idea that finance providers should take into consideration a broader scope of information than just an applicant’s financial history. Incorporating more factors, both qualitative and quantitative, into the lenders assessment means that the funder gains a more in depth understanding of the applicant and their business. This in turn results in a more educated decision in granting funding, an important consideration under responsible lending practices. Recent disruptions within Australia’s finance industry have resulted in an even more difficult lending landscape for small business owners, in particular franchisees. Many are finding that the finance solutions offered by traditional lenders and banks aren’t the right fit for their businesses unique and ever-changing needs. In addition to this, many banks are moving away from small business and franchise clients due to the perceived risk of the industry. This is reflected by a Banjo Small Business Finance Survey that found for every 10 SMEs applying for bank funding, only 2 were successful. Small business owners are now turning to alternative finance providers to gain access to funding. Such providers offer more flexible funding solutions that are a better fit for the needs for an SME, and are removing barriers to finance through simple online applications and faster approval processes. Another key characteristic of many alternative lenders that is appealing to the small business community, is the focus on relationship management. Alternative finance providers are in a unique position due to the flexibility in their financing options. This allows lenders to place a heavy focus on building and maintaining a relationship with their client, and providing funding with a view to long term sustainability through mutual support. 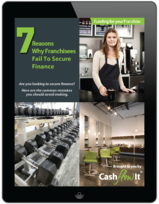 This is a philosophy that Cashflow It wholeheartedly adopts, with a view to not only further the opportunities available to individual franchisees through finance, but contribute to the growth and success of the franchise networks we work with as a whole. We aim to learn about the challenges faced by each network within the industry and tailor a funding solution to fit the needs of its franchisees. Further to this we actively seek out opportunities to become more involved by attending and supporting annual conferences and brand initiatives. We hope that by us and other lenders in the industry embracing a relationship based lending model that we are able to better service the businesses we work with and help overcome any barriers to finance facing Australia’s franchisees.